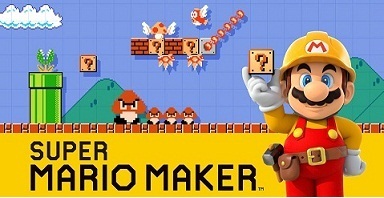 The Nintendo EAD’s latest title Super Mario Maker will be available for the Wii U on September 11 but before the creative work phase starts, already shows the home screen in the form of Easter Eggs which options you have in Jump and Run-hobbyists. To do this you simply activate with the stylus, the individual letters. The home screen, you can move with Mario free, collect coins and tracks your way to level target. But is much more interesting what happens when you touch the individual letters of Mario Maker lettering on the gamepad Wii U with the stylus. Nintendo has hidden here a few funny Easter Eggs. What do the individual letters for an effect that you see in the following table. M The M turns into a W, and you hear the derisive laughter of your rival Wario. A The background is decorated by a star shower. R A lot of coins raining down from Up. I A little cute bird makes you company. O With an airship you can move Mario through the level. M Mario gets a turtle shell as helmet. A The letter raises like a rocket into the sky. K The screen is wrapped in a sepia filter. Suppress the letter again, it will disappear. E A jump block is discarded. R An egg appears and Mario's faithful companion Yoshi hatches from it.